I played quite a bit of The Curse of Monkey Island this week so I didn't get to play Quake II as much as I should've. I've now got access to the rocket launcher though and I'm up to the fourth "unit" (or stage) in the game out of 10…. Consequently, I'm not as far through the game as I originally thought, hence why the percentage complete has remained at 30%. It seems like the campaign is actually quite substantial in duration then, which is quite a bit different to many modern FPSs where campaigns only last for a few hours. Yay! I saved one of my classmates! Thankfully, I was able to recruit the help of Moira (coz she's a badass paladin) which meant I didn't need to kill an undead boss a second time since the first time was hard enough: every time he hit me it would take at least a third of my health and this was while I had many buffs including a Null Stone active! I quaffed many a potion to defeat him that first time; I also had to sneak around the catacombs to even get a chance at finding him, so now I'm worried I won't be powerful enough for any future encounters in the game…. Guess we'll soon find out. So, it turns out that James Kidd is actually an Assassin! Looks like I'm not going to get killed by them (at least for now). I'm also wondering where I need to go in order to complete another Templar Hunt mission; I can't seem to find any more towns and all the ones in the south seem to be protected by forts. Maybe I need to try and take down some Level 1 forts before I try my hand against the more heavily defended ones in the south…. Aaaaand it's done. After playing for just over 6 hours, I've finally completed The Curse of Monkey Island, and it's just as awesome as I remember it, such as causing a lactose intolerant volcano to erupt by dropping in some cheese (yes, that's actually a puzzle solution). I also got reacquainted with several characters, not only ones from earlier in the game such as Murray, but ones from previous Monkey Island games such as Stan (who is into life insurance in The Curse of Monkey Island) and Lemonhead (one of the Cannibals from the original Monkey Island). 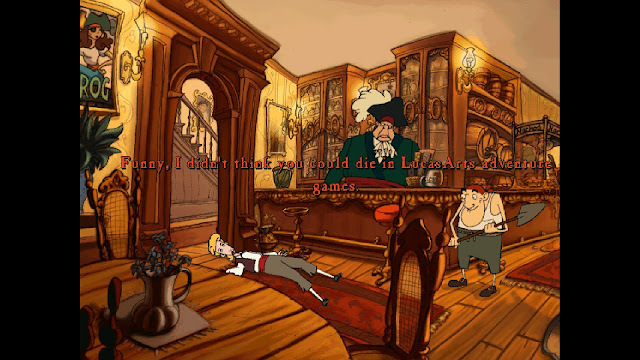 The only criticism I have with The Curse of Monkey Island is that the ending seems very rushed. The final chapter is basically just a four-room puzzle using only three new items; once you've solved it, the epilogue is just a short cutscene with no talking whatsoever. There is a post-credits cutscene though hinting towards a sequel (because remember kids, true evil can never be defeated). Now to wait for Choona to pick another Pile of Shame game for me to complete 😊.